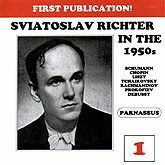 Older readers may remember the shock of discovery when the first of Sviatoslav Richter’s discs made their way to the West. Since his first US tour in 1960, of course, he has been a fixture in the American musical imagination (although not in our concert halls), and we have been able to sample a far wider selection of his art in vastly better sound than that afforded by those early LPs. Still, as Richard Taruskin reminded us in an eloquent appreciation (13:3, p. 244), the Richter of the 1950s and early 1960s was a substantially more febrile artist than the “courtly, white-mustnchioed elder statesman” he has become–snd it is therefore not just nostalgia that gives his early recordings their magnetic chraracter. BMG’s ten-disc celebration, reviewed in detail by Leslie Gerber in 19:3, resurrected a significant number of scorching early studio recordings. The five discs under review, although they retrace much of the some repertoire, document live performances, sometimes a bit sloppier than the studio versions, but often fueled by an even more impetuos spirit and reaching an even higher emotional temperature. This is especially evident in the stunning, four-disc salvo from Gerber’s own Parnassus Records, which brings us five hours of new recordings, in surprisingly serviceable sound, that have apparently never been released before. The contents consist largely of early-Richter staples-but the high-contrast peformances are, without exception, knockouts. All of Richter’s interpretations demonstrate a staggering diversity of touch (note how his hard-bitten account of Rachmaninov’s op.32/7 melts away at the end) and an almost unerring rhythmic control, both of small gestures and of larger paragraphs–note, for instance, how the Chopin Etude, op. lO/I, explodes forth as a single utterance. But what marks Richter’s early virtuoso efforts in particular is the way these qualities combine to grip you, rather than persuade you. There are other Richter performances that are more lighthearted (for instance, his four-hand Mozart with Britten; see 16:1); there are others, like his early 80s Tokyo Prokofiev (17;3), that offer more density of detail; and there -are certainly others (most notably his contoversial Schubert Bb, 6:4; see Michael Ullman’s dissent in 14:4) that convey deeper philosophical insights. But his early performances have a demonic intensity that was often tempered in his later years; and these four discs offer ample opportunity to experience, undiluted, the aural adrenaline rush that Taruskin described. Certainly, no one else manages to steer through the Schumann Toccata with such brio, largely because no one else, not even Horowitz, manages to shape the music’s syncopations so that the textures never clot. In part because of a quicker tcmpo, but also in part because of a greater sense of abandon, this fierce account of the finale of the Prokofiev Seventh is even mord overwhelming than his famous studio version. And despite moments of apparent brusqueness (patience is not in high supply on these discs), this 1953 dash through Pictures is so impulsive as to make his classic Sofia account seem almost blasé. I don’t mean to suggest that these are relentlessly steely readings in the manner of Simon Barere. Richter has an astonishing capacity for elegance. too (try the sixth of the Prokofiev Visions) and his Rachmaninov, like the first movement of his Scriabin Second, can be extremely lush: try, for instance, the superb weighting of the cadences on op. 23/4. But when, for instance, he heightens the contrast of the first movement of the Tchaikovsky Sonata by sweetening up the second theme, he manages to do so without dissipating the sense of urgency–transforming, by sheer willpower, the music’s redundancy into propulsion. There are claws beneath the velvet passages in this chipper Tchaikovsky Concerto as well; and although his Scriabin Sixth and his Schumann Humoresque both manifest a remarkable sympathy for the music’s mercurial swings, there is an underlying edge to both works that is apt to keep you off balance. Given the extent to which the Parnassus repertoire duplicates that of recordings already in the catalog (more or less contemporaneous performances with a similar interpretive slant and superior sound), I will resist the temptation to promote these discs as the best introduction to Richter’s art of the 1950s: but Richter aficionados should find them an invaluable supplement to their collections. Highly recommended. One major modern pianist who, like Glenn Gould, has steadfastly marched to his own drummer is Sviatoslav Richter. While Gould renounced the concert platform for the recording studio when he turned thirty. Richter, perhaps even more the ecstatic introvert, has come close to renouncing the recording studio for the concert platform–and he now plays only when and where the whim strikes him, and only in remote venues of his own choosing. These volumes of live performances taped in Moscow in the 1950s allow us to understand what Emil Gilels was talking about when he told adoring western audiences, “Wait till you hear Richter!” The enigmatic, slightly veiled quality of some of Richter’s recent performances is not heard here. This is powerful, virtuosic, imaginative, and highly communicative playing by a young keyboard colossus. The sound of these live recordings, while variable, is never worse than fair: listenable 1950s Russian mono. First, the good news: As a rule, the sound has considerable impact and presence. Now, the bad news: The highs can be tinny, and the sound occasionally shatters at high volumes. Still, most of the time, these recordings capture Richterian delicacy aptly while handling Richter’s massive fortissimos without distortion. Compared to the old Monitor LPs of Richter–where a microphone placed under a horse, blanket in a galaxy far, far away seemed to represent the state of the Soviet sound engineering art–these discs get us “closer to the music. In terms of repertoire, these recordings deal from strength. Prokofiev, Rachmaninov, Debussy, Tchaikovsky, Schumann, and Mussorgsky are composers close to the center of Richter’s musical vision. Noting that these four discs contain no Beethoven, Mozart, Haydn or Schubert, and only a smidgen of Chopin and Lizst, one begins to sense just how broad Richter’s musical center actually was–and is. Highlights for me are many, including Vol.1’s Prokofiev Cinderella transcriptions, played with amazing vigor, plus an awesome Prokofiev Sonata No. 7. Similarly engrossing are Richter’s exciting versions of about half of Rachmaninov’s Preludes and a stirring Tchaikovsky Grand Sonata, a Richter specialty. Vo1.2, which enshrines live October 1952, June 1955, and 1957 Moscow performances, provides an eloquent Schumann Humoresque, a mystery-ringed Scriabin Sonata No.2, a fine pair of Debussy “Cloches à travers les feuilles” (as encores from two concerts), and a terrific Mussorgsky Pictures at an Exhibition. This is not the famous, and extraordinary, 1958 Sofia Pictures, taped in gritty mono before a Bulgarian audience apparently celebrating a bronchitis festival. Rather, this is a fresh sounding 1952 mono version, taped before a nearly silent Moscow crowd. This Moscow version is much easier to listen to; it sounds, to my ears, more nuanced and coherent, and it lacks only the heaven-storming, galvanic strength of the Sofia final movements to merit a place in pianism’s ultimate Valhalla. By any rational standard, this is a superb performance. The Tchaikovsky Concerto has rugged strength and some delicacy, but the orchestral sound is limiting and the USSR State Sym- phony under Nathan Rachlin sounds ragged at times. There are, frankly, better versions out there–including at least one by Richter. Veteran Fanfare reviewers Leslie Gerber and John Wiser, who traced these never-before-released live recordings back to unspecified sources in Russia. serve as producer and production assistant, respectively, in what is clearly a labor of love. Gerber is an eminent Richterian, and his brief notes are excellent. Seasoned Richter fans may have accumulated later studio versions of several of these pieces, but Richter’s early live performances. with their electric intensity, make their own insistent claims, while telling us a lot about his development as an artist. Because of their very direct brand of communication, and their convenient, compact presentation of his core repertoire, these discs would serve as a wide ranging and attractive introduction to anyone new to Richter’s extraordinar~ brand of pianism. All in all, a mind-boggling five hours of music on four discs, neatly compressed into two separately purchasable slimline jewelcases. …In his younger days, Richter’s repertory and style were more those of a concert virtuoso than the thoughtful end deeply probing musician he became. But even then, he never dis- played his prodigious technical skills merely for their own sake; he always used them, with utter naturalness and total commitment, to make wonderfully romantic and very beautiful music. Here, for instance, is a 1955 performance of Schumann’s Humoresque (which he recorded only once again, a year later)–that strange piece, with its host of ideas elbowing each other aside from beginning to end–that is brilliant, passionate, and deeply moving. His ferocious version of Prokofiev’s thorny Sonata 7 is wholly convincing in musical terms. In this early version of Pictures, he does not yet have the mastery of style and content of his 1958 Sofia performance, but the finale (‘The Great Gate of Kiev’) is a glorious triumph of sonority piled on sonority. In the Tchaikovsky Concerto, the orchestra is pretty awful and the first movement is curiously disjointed, but he ends the piece with an astonishing burst of pyrotechnics. The Rachmaninoff Preludes are played with dark passion, intensity, and a remarkable range of tone and.color. And so on, with other pleasures too numerous to mention. The sound on these discs is not great, and there is a fair amount of audience noise, but neither problem is so bad that it interferes seriously with our appreciation. They are essential for Richter fans, fascinating for those interested in following the development of a great artist, and very rewarding for everyone else who loves to hear beautiful music superbly played.